Sheds are about doing. Stretching one’s horizons with respect to skills. Note these. 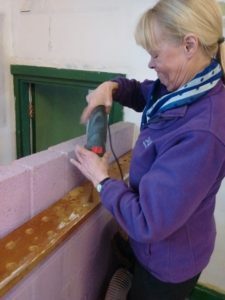 Mary is getting well into the use of power tools. Something previously beyond her experience. Just look at her face – sheer determination! 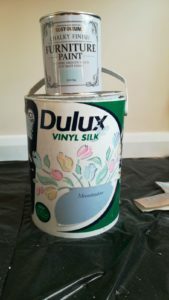 We have some small furniture items to refurbish and Shedder Marie has bought appropriate paints and brushes. We also have a new small (and manageable) power sander (for Mary to play with?). However, (Redcar) Shedder Paula has been doing upcycling homework on a tall pub table. 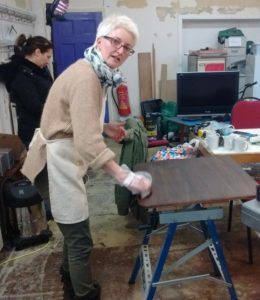 Men’s Shedder Lance has helped with the table top which is due to be reunited next week with “the leg”. 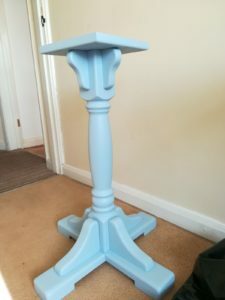 The table was fully dismantled, sanded, painted with “chalk” paint and reassembled. Duck egg blue colour on the tin. However, the Duck Egg blue was too green (apparently), so extra blue was added. Paula staining the table top. With the Eskmouth stage continuing to be upgraded, we can now more easily get involved with furniture refurb/upcycling.